There were 265 press releases posted in the last 24 hours and 153,583 in the last 365 days. For the third year in a row, eLeaP has been named to the top 10 most user-friendly Learning Management System software list by Capterra, a Gartner company. LOUISVILLE, KY, USA, January 28, 2019 /EINPresswire.com/ -- Telania, LLC. 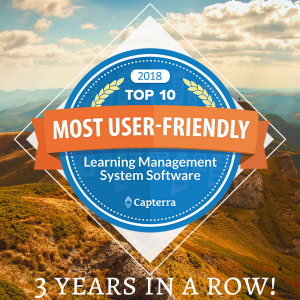 announced today that its cloud-based eLeaP Learning Management System platform has once again made the list of Top 10 Most User-Friendly Learning Management software by Capterra, an online service that helps companies find the best software solutions. President Don Weobong had this to say about Louisville-based eLeaP, “First of all, 'What is LMS?' It's a tool to help organizations streamline their training operations. Wow! For an unprecedented third year, eLeaP has been awarded the highly coveted top-10 most user friendly LMS platforms. We are humbled and promise our customers and supporters to continue working hard to make them proud. Thank you Capterra!”. Capterra determines who makes the list by examining 3 factors: ease of use, customer service experience, and customer reviews. View the Top 10 User-Friendly Learning Management list here: https://www.eleapsoftware.com/top-10-most-user-friendly-lms/ . Since its launch in 2003, eLeaP has remained dedicated to continually growing to meet the needs of the ever-changing technology landscape. eLeaP makes it easy for businesses to deliver on-demand training that encourages their employees to learn. The system allows businesses to streamline their training process and meet rigorous compliance requirements. eLeaP conveniently integrates with other software products using API, Single Sign-on and custom integration. Many HRIS systems and ERP platforms require this kind of integration. With eLeaP, we have simplified this IT-intensive process, allowing our clients to implement their LMS instance quickly and efficiently. For more information or to try a free trial, visit their website: https://www.eleapsoftware.com/ eLeaP comes with a full-service customer support team as well as an extensive library of training videos and support documentation to enable anyone to quickly get up to speed creating and delivering content in no time.